Sidebend World shows clearly why Webb has been called one of the most inventive, incisive, and psychologically astute poets writing in the U.S.A. today, as well as one of the most entertaining. Webb is celebrated for his use of humor; yet even his funniest poems rise, as the best humor must, from serious concerns. 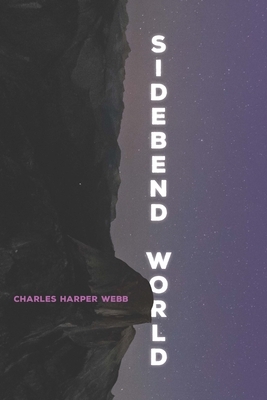 Powered by an uncompromising but compassionate intelligence and an abiding wonder at the beautiful strangeness of the world, Sidebend World explores with clarity and vividness a wide range of emotions—love to hate, tenderness to brutality; yet, above all, Webb is a poet of praise. Metaphors of startling aptness and originality, a distinctive voice at once provocative and endearing, high musicality, propulsive energy, wild imaginative leaps, as well as mastery of diction from lyricism to street-speak, create a reading experience of the first order. These poems go down easy, but pack a wallop. As Robert Frost said poetry should do, Sidebend World "begins in delight and ends in wisdom." Called by Lifescape “Southern California’s most inventive and accessible poet,” Charles Harper Webb, Ph.D. has published twelve books of poetry, including Reading the Water, Liver,Tulip Farms & Leper Colonies, Hot Popsicles,Amplified Dog, Shadow Ball: New and Selected Poems, What Things Are Made Of,Brain Camp, and his most recent, Sidebend World, published by the University of Pittsburgh Press in 2018. Webb's awards in poetry include the Morse Prize, the Kate Tufts Discovery Award, the Felix Pollock Prize, and the Benjamin Saltman Prize. His poems have appeared in distinguished journals and anthologies, including American Poetry Review, Paris Review, Iowa Review, Yale Review, Harvard Review, Poetry, Ploughshares, The Southern Review, The Georgia Review, Tin House, Poets of the New Century, Best American Poetry, and The Pushcart Prize. A former professional rock musician and psychotherapist, he is the editor of Stand Up Poetry: An Expanded Anthology, and recipient of a Whiting Writer's Award, a fellowship from the Guggenheim foundation, and the CSULB Distinguished Faculty Teaching Award. A collection of his essays on contemporary American poetry, A Million MFAs Are Not Enough, was published in 2016 by Red Hen Press. Professor of English at California State University, Long Beach, Webb teaches in the MFA Program in Creative Writing there.